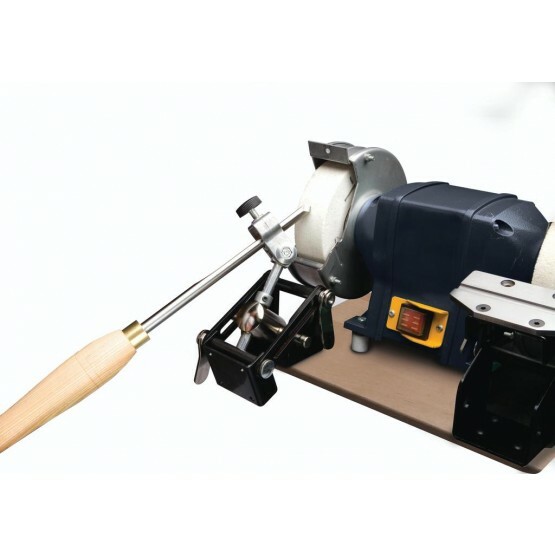 Deluxe Universal Sharpening System. Deluxe system that incorporates all the features of both the Fingernail Profiler and the Universal Sharpening System. Changes from fingernail profiling to standard use in seconds. It IS designed to be bench fixed and improves accuracy when sharpening using a stone grinder. Incorporates Fingernail Profiler – Profile arm removable for ease of use – Includes angle finder jig – Fully adjustable for bevel angle & side grind – Large stable sharpening platform. -Designed to produce a range of different fingernail profiles with ease. – Pre-set to replicate medium profile on Robert Sorby fingernail profile gouges.